The headlines have raged: SF car break-ins up 31 percent, nearly triple in 5 years, read one. Still, few tourists seem aware that all it takes for an auto burglar to take computers, cameras and whatever else is lying around a locked car is to smash the window and reach in. Such smash-and-grabs, as they are aptly named, have been on the increase, and no one is more vulnerable than the unsuspecting tourist, police say. “We were a bit more relaxed; since we are here in the States, we assumed it would be safer than things back home and didn’t think it would be an issue to leave things in the car,” said Daniel Concha, who is visiting from Mexico with his partner, Mercedes Amor. “We were changing hotels and stopped to grab a quick bite to eat, ” Amor said. “When we came back, our bags were gone, with all of our documents.” They had parked their rented car on Post Street and, in seconds, lost their Mexican passports and visas. Amor and Concha — along with other victims of auto burglaries — were at the Northern District Police Station, which covers the tourist spots of Palace of Fine Arts, Japantown and Alamo Square. The Mexican couple, who needed a police report to get temporary documents from the Mexican consulate, went to the station the night of the theft, but were told to return in the morning. There were simply too many people filing reports that night. Over the course of two mornings earlier this month, eight of the 20 cases filed at Northern District Police Station concerned auto burglaries. The station has a plainclothes street crimes team with two sergeants and eight officers that more or less deal with auto burglaries full-time, he said. 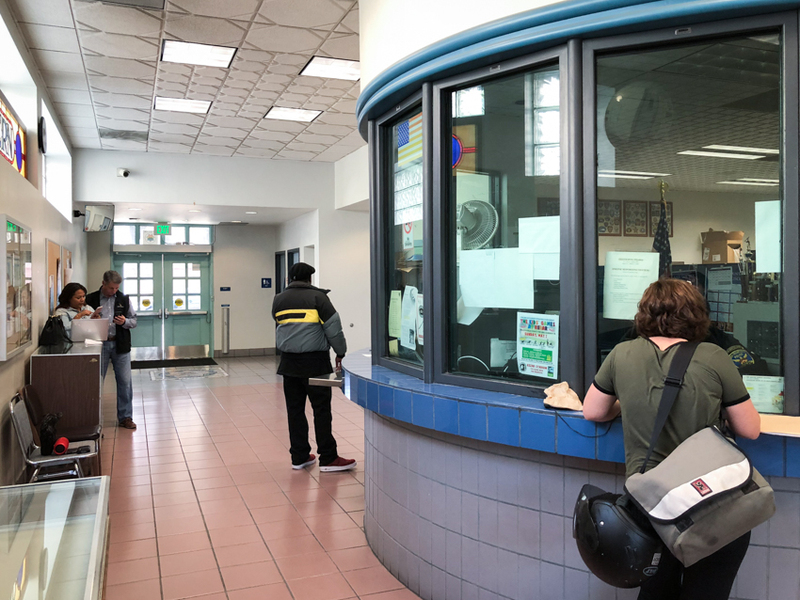 Another couple that had recently moved from New York arrived at the station at 10 a.m. — too late on a busy morning to get one of the three seats for walk-ins. Instead, they leaned against one of the glass cases that holds SFPD swag for sale and recounted their smash-and-grab experience. Serrano said she tried to call 911 and 311, but got nowhere. Next, she tried to file through SFPD’s website online reporting system. The tourists or newcomers were sometimes joined by residents. Kim Larkin, who is in her late 20s, had her car broken into in the Pacific Heights area. “It was either last night or this morning, but I just found it,” she said. She called 311 and they told her to come in to the station. On the upside, Jaimerena said they had had a lot of witnesses calling in. “Residents, business owners, you know, it’s all over the papers, everybody’s sort of always looking out for auto burglars now,” he said. I would really like to kill the people who are doing this.